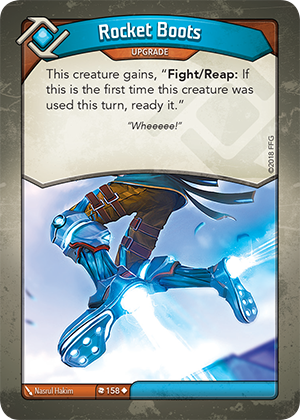 If Rocket Boots is used to upgrade a creature that already has a “Fight:” or “Reap:” ability, does that creature get to use all abilities associated with that type of use? Yes. When a player uses a creature to reap, the player exhausts the creature, gains 1 Æmber for their Æmber pool, and then all “Reap:” abilities on the creature resolve. When a player uses a creature to fight, the player exhausts the creature and – if the creature is not destroyed during the fight – all “Fight:” abilities on the creature are then resolved. In each scenario, if there are multiple abilities to resolve for a particular action, the active player chooses the order in which those abilities resolve.